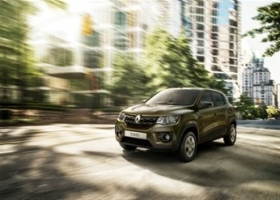 Demand for the Kwid small crossover helped boost Renault's India sales last month. NEW DELHI – Renault’s sevenfold surge in vehicle sales fueled growth in India's auto market in July, extending the industry's streak of gains to 13th consecutive months. Demand for the Kwid small crossover pushed demand for Renault vehicles to 11,968 deliveries last month. Industrywide passenger vehicle sales rose 17 percent in July to 259,685, the biggest gain since October 2015, Society of Indian Automobile Manufacturers said today in New Delhi. Monsoon rains boosting farm output and falling fuel prices are lifting consumer sentiment, according to Rakesh Srivastava, senior vice president for sales and marketing at Hyundai Motor Co.'s local unit. State-owned refiners have been cutting gasoline and diesel prices, and rainfall in the June-to-September monsoon season has been above normal, benefiting a country where about 30 percent of passenger vehicles are sold in rural areas. Domestic sales of Maruti Suzuki India increased 14 percent, with deliveries of SUVs including the compact Vitara Brezza more than doubling. The country's biggest automaker by volume raised prices this month of some models, including the Vitara Brezza and Baleno hatchback, citing demand and currency swings. Hyundai, which posted a 13 percent jump in India sales last month, also said it will increase prices starting Aug. 16. Mahindra & Mahindra Ltd. reported a 20 percent jump in deliveries.